It's back to school time and why not make a good impression on your first day with this purple, black and silver chain lanyard? This lanyard can also be worn as a necklace if you take the ring off. So you're getting 2 accessories in 1! 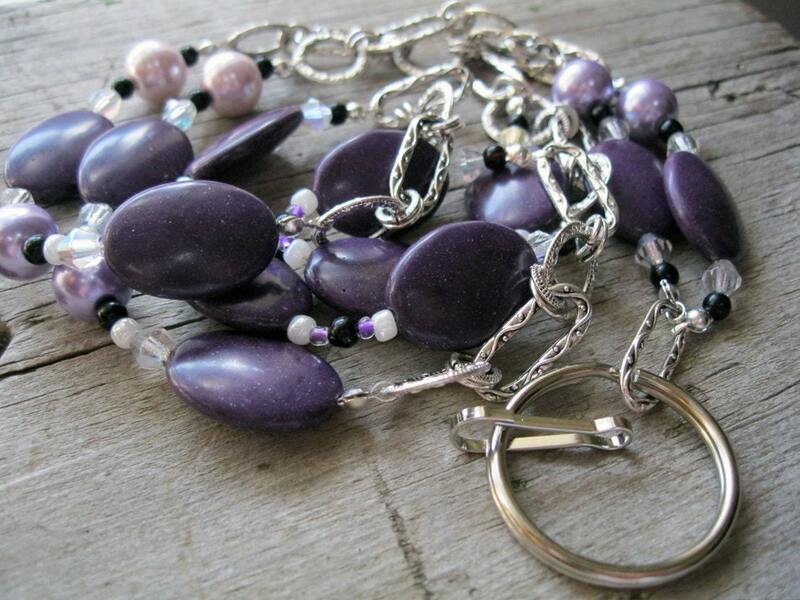 Deep purple agate stones are the focal point on this chain. Silver textured chain is used to add interest and lighten the look. Purple and lavender pearls are used as well to add contrast. Nestled between a variety of white and purple lined glass beads are round black beads. The iridescent bicones really pick up the purple from the agate. This is perfect for school teachers, professionals and for a February birthday gal. Amethyst is the birthstone for February.